What's the best way of getting the most out of study and teaching time? What should you do to best prepare for an exam or to boost your learning ability? 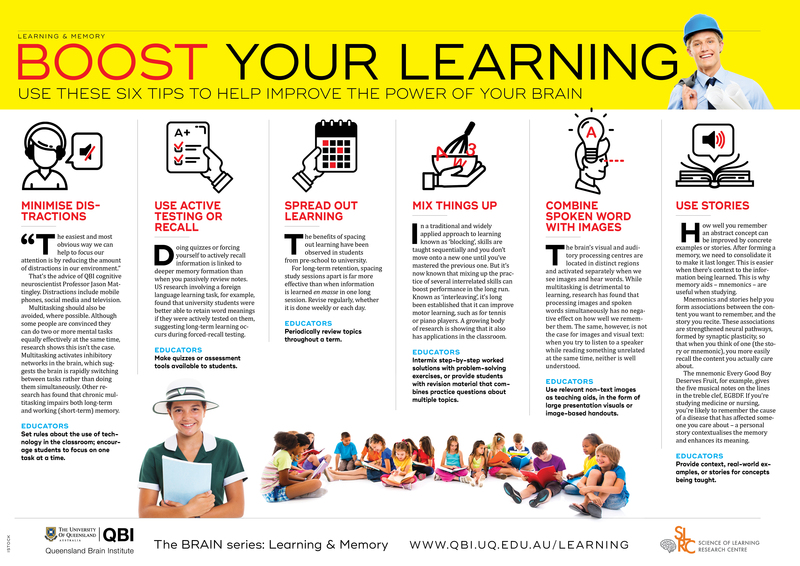 Here are experts' top tips for maximising learning. 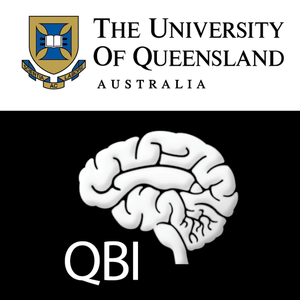 That’s the advice of QBI cognitive neuroscientist Professor Jason Mattingley. Distractions include mobile phones, social media and television. Multitasking should also be avoided, where possible. Although some people are convinced they can do two or more mental tasks equally effectively at the same time, research shows this isn’t the case. Multitasking activates inhibitory networks in the brain, which suggests the brain is rapidly switching between tasks rather than doing them simultaneously. Other research has found that chronic multitasking impairs both long-term and working (short-term) memory. Educators: Set rules about the use of technology in the classroom; encourage students to focus on one task at a time. Doing quizzes or forcing yourself to actively recall information is linked to deeper memory formation than when you passively review notes. US research involving a foreign language learning task, for example, found that university students were better able to retain word meanings if they were actively tested on them, suggesting long-term learning occurs during forced-recall testing. Educators: Make quizzes or assessment tools available to students. The benefits of spacing out learning have been observed in students from pre-school to university. For long-term retention, spacing study sessions apart is far more effective than when information is learneden masse (cramming) in one long session. Revise regularly, whether it is done weekly or each day. Educators: Periodically review topics throughout a term. In a traditional and widely applied approach to learning known as ‘blocking’, skills are taught sequentially and you don’t move onto a new one until you’ve mastered the previous one. But it’s now known that mixing up the practice of several interrelated skills can boost performance in the long run. Known as ‘interleaving’, it’s long been established that it can improve motor learning, such as for tennis or piano players. A growing body of research is showing that it also has applications in the classroom. Educators: Intermix step-by-step worked solutions with problem-solving exercises, or provide students with revision material that combines practice questions about multiple topics. The brain’s visual and auditory processing centres are located in distinct regions and activated separately when we see images and hear words. While multitasking is detrimental to learning, research has found that processing images and spoken words simultaneously has no negative effect on how well we remember them. The same, however, is not the case for images and visual text: when you try to listen to a speaker while reading something unrelated at the same time, neither is well understood. Educators: Use relevant non-text images as teaching aids, in the form of large presentation visuals or image-based handouts. How well you remember an abstract concept can be improved by concrete examples or stories. After forming a memory, we need to consolidate it to make it last longer. This is easier when there’s context to the information being learned. This is why memory aids – mnemonics – are useful when studying. Mnemonics and stories help you form associations between the content you want to remember, and the story you recite. These associations are strengthened neural pathways, formed by synaptic plasticity, so that when you think of one (the story or mnemonic), you more easily recall the content you actually care about. The mnemonic Every Good Boy Deserves Fruit, for example, gives the five musical notes on the lines in the treble clef, EGBDF. If you’re studying medicine or nursing, you’re likely to remember the cause of a disease that has affected someone you care about – a personal story contextualises the memory and enhances its meaning. Educators: Provide context, real-world examples, or stories for concepts being taught.